In this research guide you will learn how to get a COMPLETE, non-commercial, Statewide list of Assisted Living & Senior Living Facilities Provided by the State of South Carolina. I’ll get right to the point and say that South Carolina is not one of the easiest states to research assisted living in. There are a few reasons for this. 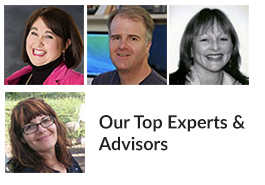 First, the State of Carolina is one of those handful of states that does not officially recognize the term ‘Assisted Living’ – which is unfortunate, since that is likely the term that most people will use to research care. 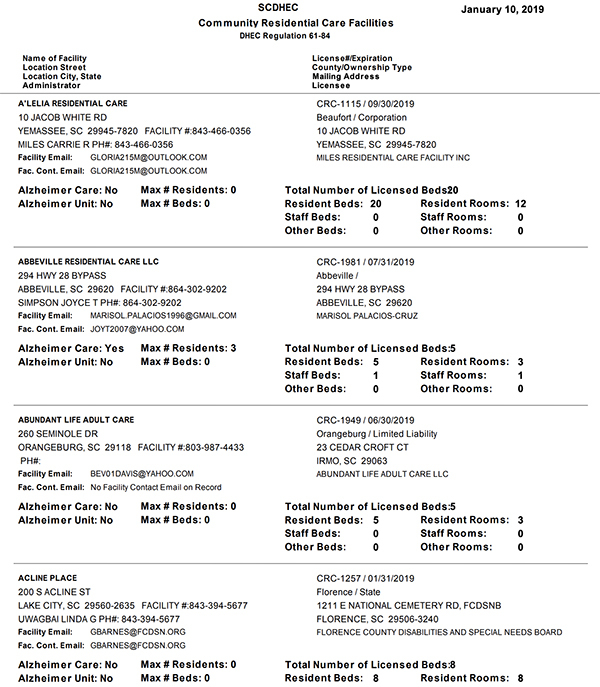 At this time, there are 495 Licensed CRCF (Assisted Living) communities in South Carolina, with 20,608 beds. 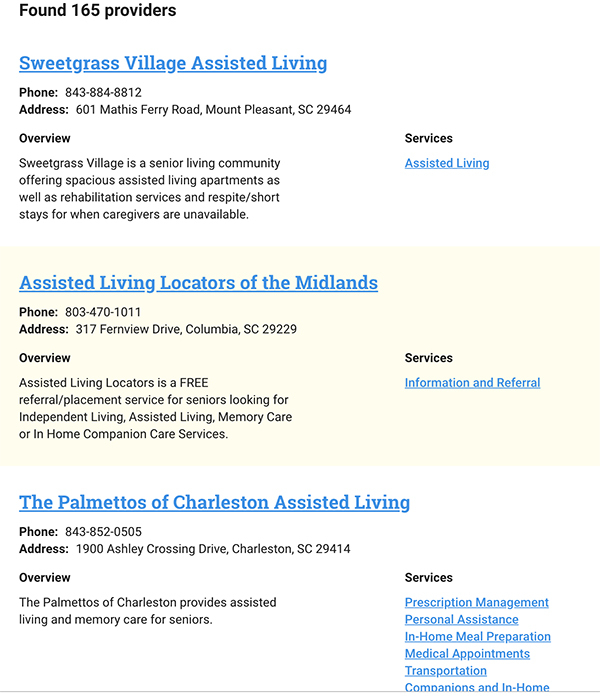 There is one great way you can use to get a full list of ALL Licensed Assisted Living Facilities in South Carolina. This method bypasses the typical for-profit site you’ll come across doing a standard search. This list is provided through the State of South Carolina’s Department of Health & Environmental Control. 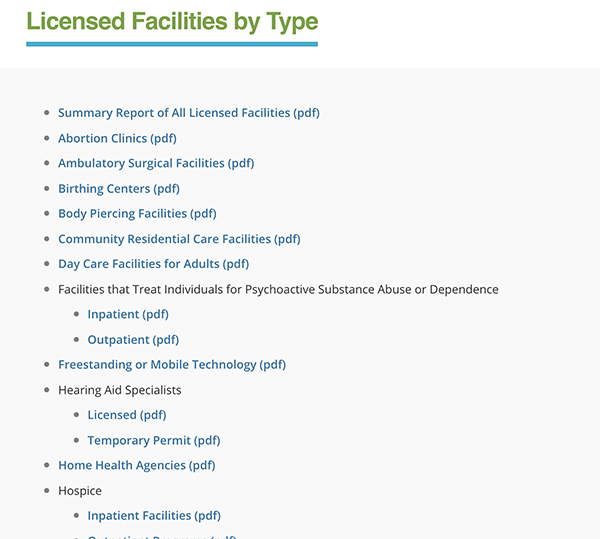 Visit the DHEC’s “Licensed Facilities by Type” page where you will see a list of the various different types of Licensed Healthcare Facilities and Senior Living Communities in South Carolina. You’ll see Nursing Homes and Community Residential Care Facilities in the list. Choose your Facility Type. For our example here, we’ll choose Community Residential Care Facilities. You’ll then get a full list of all current licensed CRCF Facilities in South Carolina. This list can be easily saved or printed. 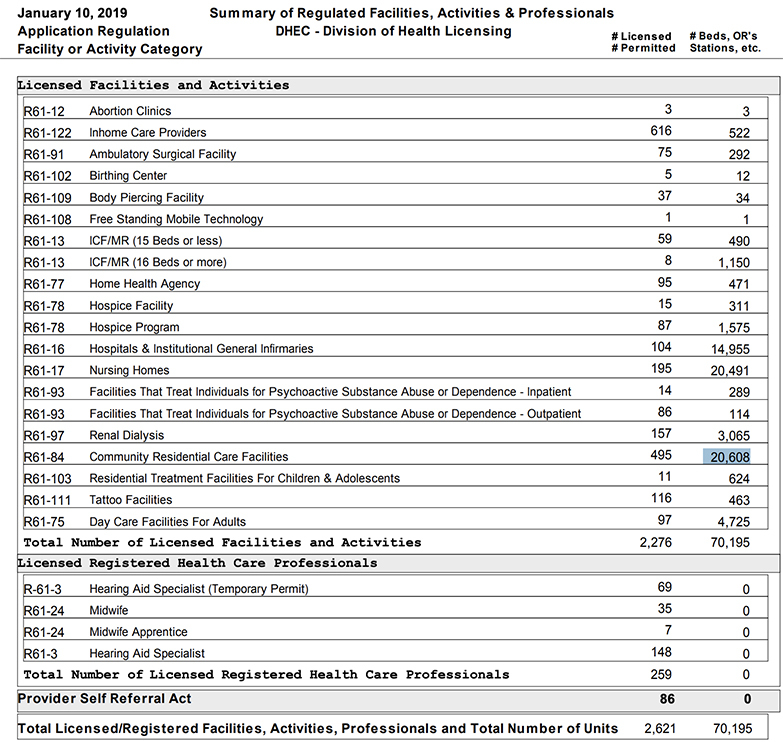 The Facility List (.pdf) will look like this, and at this time is over 100 pages long. 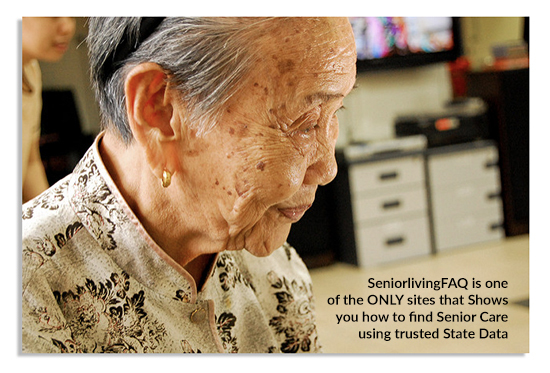 This facility data is likely enough for you to decide whether it is a viable option for you or your loved one. Selecting a facility brings up another round of useful, ad-free data. 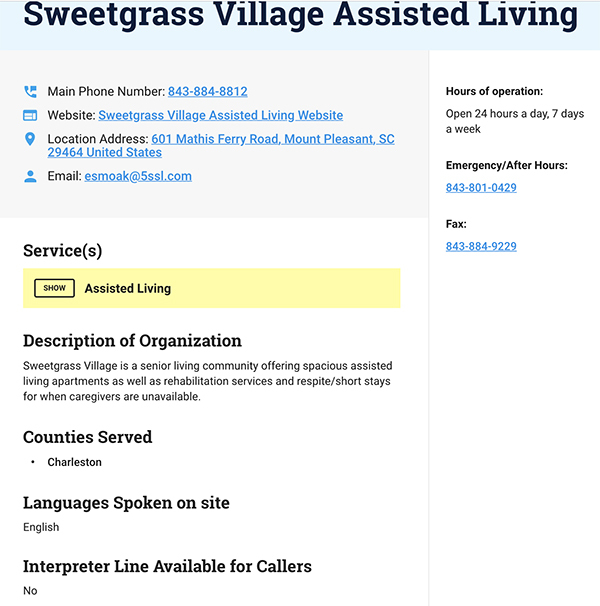 Simply put, you can access South Carolina’s Assisted Living Regulations here. 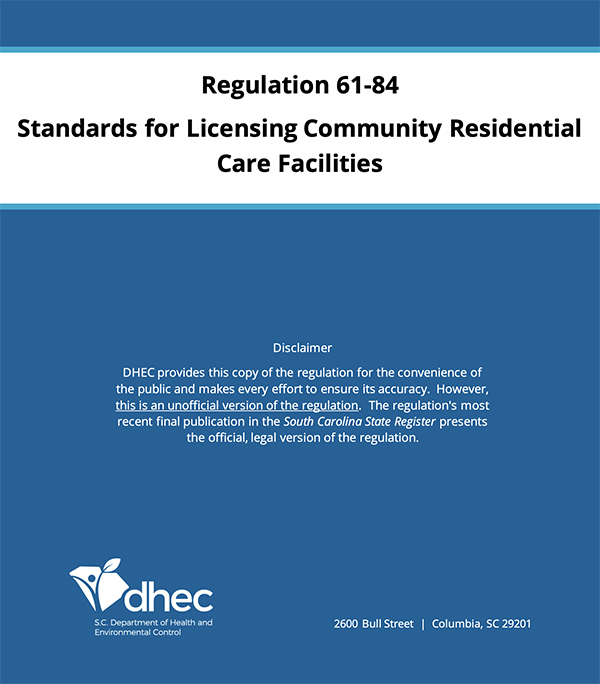 This is a long, .pdf document containing the Licensing Standards and Regulations for the State’s Community Residential Care Facilities / Assisted Living Facilities. This is a meaty manual, covering quite a lot. However, it is a smart move to be familiar with what it covers. This goes for both families, and residents (if they are cognitively able to). Knowing the rules, regulations and standards for Assisted Living can help you to know when those standards fall short, and what to do about it if an incident, or abuse happens. This also goes for any issues with Resident Rights. Often times, abuse and neglect in Senior Living homes goes unchecked or unchallenged simply due to lack of awareness of standards and rules. Additionally, submitting a complaint often times confusing or scary to the resident, for fear of retaliation or future consequences. You have a few options to do so. Complaints may be submitted anonymously, however, there will be no way to update you as to the progress or findings of the complaint. Anonymous complaint reporting can be useful though, in cases where the resident fears retaliation or consequences. Mail complaints to DHEC, Bureau of Health Facilities Licensing , 2600 Bull Street, Columbia, SC, 29201 or fax complaint to (803) 545-4212. (803) 545-4370 and let the operator know that you wish to file a complaint.